Bright and clean, this contemporary kitchen has plenty of storage to accommodate the needs of a family of four. Redesigning the original “L” shaped kitchen allowed for a substantial island area to be included in the new layout. 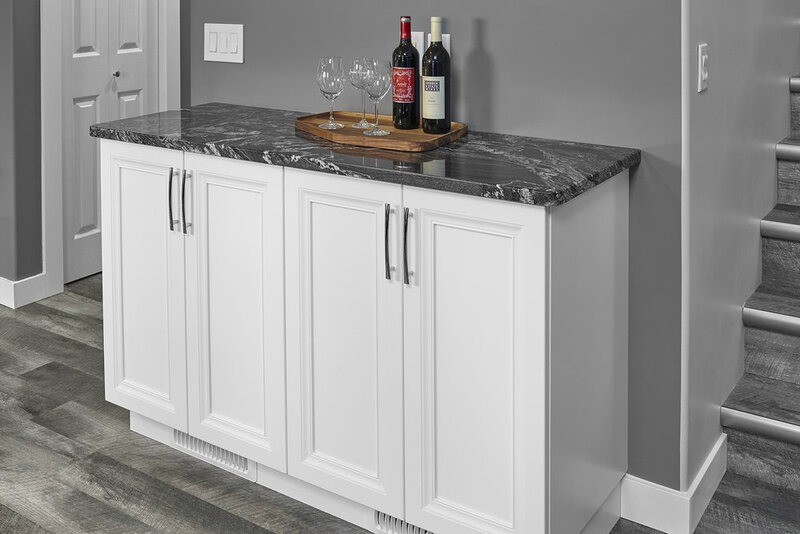 The granite countertop is a bold choice that anchors the whole space. The countertop on the island provides additional working space and the extended overhang has hidden stealth braces for support and a comfortable seating area. Pantry roll out shelves, custom inserts for cutting board storage and a double waste bin conveniently located by the sink, are just some of the individualized details that make this space function through planned design. Drawer Box: Birch Dovetail with concealed full extension drawer slides & soft close hinges. The clean lines, chrome details and the substantial crown mould highlight the simplicity of the design that is visually stunning. Functional details like drawers on the island that were customized to include electrical plugs and heat register outlets included in the buffet toe kick.